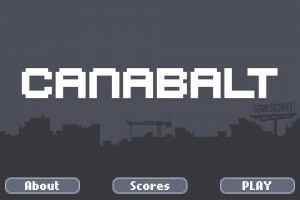 ‘Canabalt’ – Run For Your Life! I got a first look at Semi Secret Software’s Canabalt [App Store] back at GDC Austin, received a preview build a few days later, and since then the game has soaked up an extraordinary amount of my free time. Canabalt has the same appeal to it as other extremely simple games for the iPhone like Doodle Jump [99¢] or the various NimbleBit games such as Scoops [$1.99]. The premise is simple– You play as a guy who is running across roof tops attempting to escape from some kind of alien invasion that is constantly taking place in the background scenery. Along the way you will need to hop over boxes, break through windows, jump from crumbling buildings, and avoid other obstacles. The only control you have in the game is over your character’s jumping. Tapping anywhere on screen jumps, and the longer you press the screen the higher you jump. What sounds like a very simple game quickly turns in to a fast paced reaction game that will have you trying over and over again to make it just a little farther. 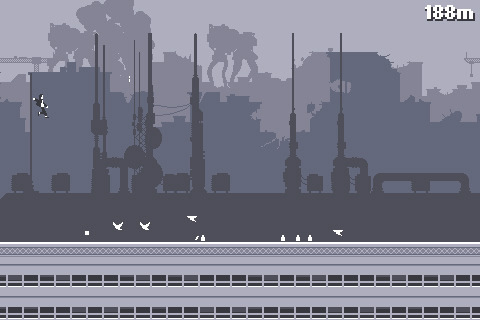 Canabalt for the iPhone is a port of the extremely popular flash game of the same name. Absolutely everything has been preserved in the transition, and Canabalt is a perfect for a mobile gaming device. It loads quickly, and the games (unless you’re really good) rarely last any more than a couple minutes. Canabalt badly needs an online leaderboard system, which according to the developer is coming in the first update. There is no lite available, but Canabalt (in its complete form) is playable online for free at Canabalt.com, and we’ve also embedded the full game here. Click below to play the full flash game. Click your mouse button to jump. I highly encourage you to give it a try, I’ve probably sunk more combined hours in to Doodle Jump than any other game on my iPhone, and Canabalt has the exact same appeal. The pixel art graphics are great, the soundtrack is phenomenal, and short of the lack of an online leaderboard it’s hard to find anything not to like about the game.